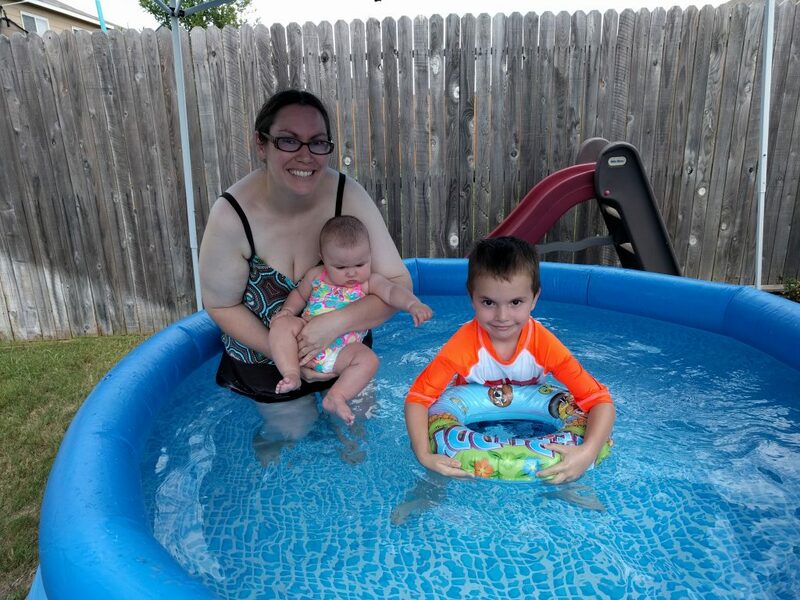 Weekly Happenings: We survived our first full week of summer vacation, haha. I don’t think I quite realized just how much time was eaten up by dropping Joseph off at pre-k, having him there for a few hours, and then going to pick him up until we weren’t doing it anymore! We’ve been eating up all the free time, though. It’s nice to be able to relax. 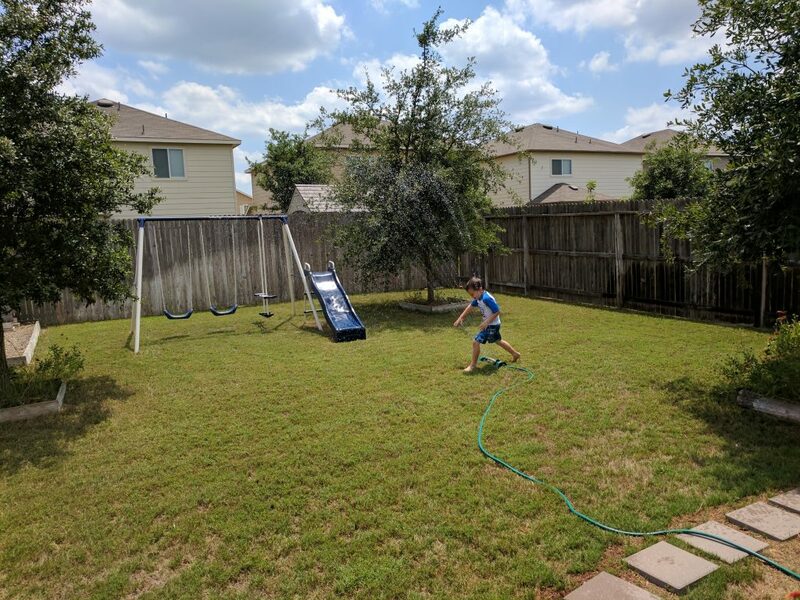 We went to the library to get Joseph new books, had a park play-date, had friends over (when my visiting teachers came), played in the sprinklers (well, Joseph did), etc. The Weekly Weather: We had a storm come through last Sunday while we were in church, but the rest of the week was sunny. I think we’re supposed to have another storm come through this next week, but it’s supposed to mostly be like this past week was: warm and sunny. What Paul’s Been Up To: He’s been working on projects for school and has been busy as usual at work. He also put our pool up so that we could go swimming yesterday. He got to do some fun stuff, too. He went to go see the new Wonder Woman movie with a friend on Friday night…then another friend asked him yesterday morning if he wanted to go see it in the evening, so he saw it again, haha. He said it was a good enough movie that he didn’t mind seeing it twice. 🙂 He doesn’t get much “guy time”, so I’m glad he has some friends that he can get out and do stuff like that with. What Sarah’s Been Up To: My first experience teaching Gospel Doctrine (last Sunday) went off without a hitch. Since the other teacher and I flip-flop, I get a break today. Other than that, I mainly just kept the kids healthy, happy, and entertained. I took the kids to the park to meet up with friends, enjoyed a visit from my visiting teachers, I set up the sprinkler so that Joseph could play in it, and the kids and I took the inaugural dip in the pool (Joseph stayed in longer than Abigail and I did…since she’s still so little, she gets cold easily, so we didn’t stay in very long). 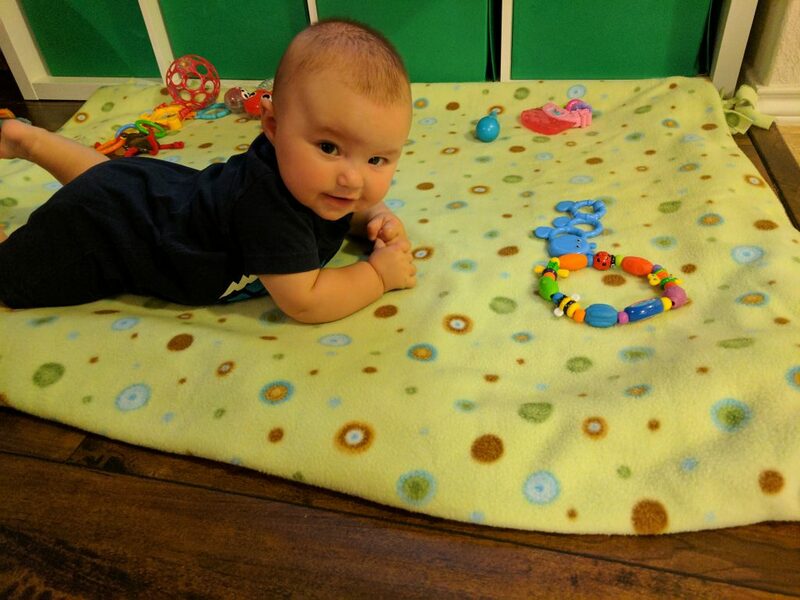 What Abigail’s Been Up To: Now to get to the “milestone moment” that I eluded to in the title of this post. We’ve transitioned from one meal of solid food per day to four meals. She has oatmeal in the morning and evening and then for her two other meals, she has a veggie and a fruit. She still gets a sizable bottle with each meal to make sure her belly gets full. 🙂 At first, she didn’t seem very excited about the baby food itself, but would practically devour the oatmeal (as in, I couldn’t get it into her mouth fast enough). After thinking about it, I thought it might be a texture thing (the baby food is quite a bit runnier than I make the oatmeal). So, acting on what can only be described as a prompting from Heavenly Father, I added a bit of the dried oatmeal to the baby food, making it the consistency of her oatmeal. It was like night and day! She ate really well yesterday, without getting frustrated. It was so great. 🙂 She’s also sleeping better (she normally wakes up a bit any time between 3-5 but goes back to sleep pretty quickly and sleeps until about 6:30 or so), hasn’t been spitting up much (or some days, not at all), and is an even happier baby (if that could be possible). 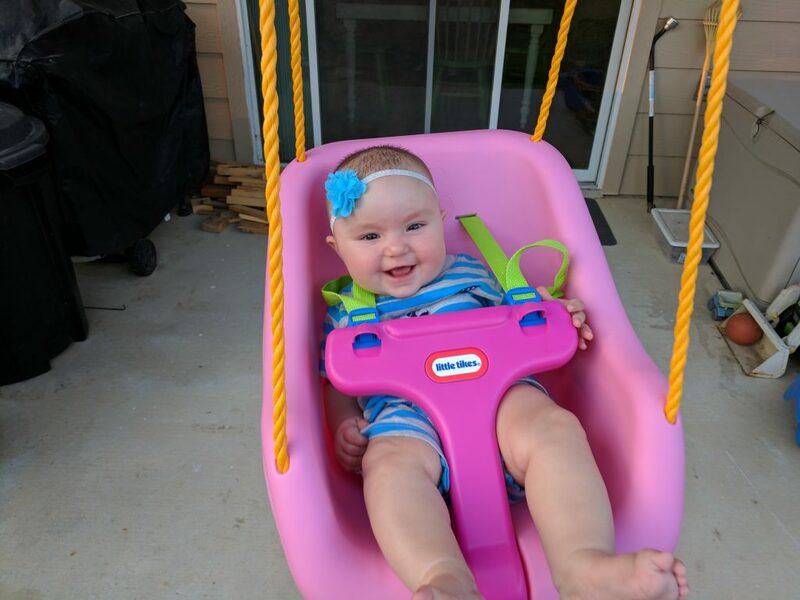 We also got a new baby swing (we pulled out Joseph’s old one to realize that it was pretty worn; luckily they’re pretty inexpensive) which she loves. 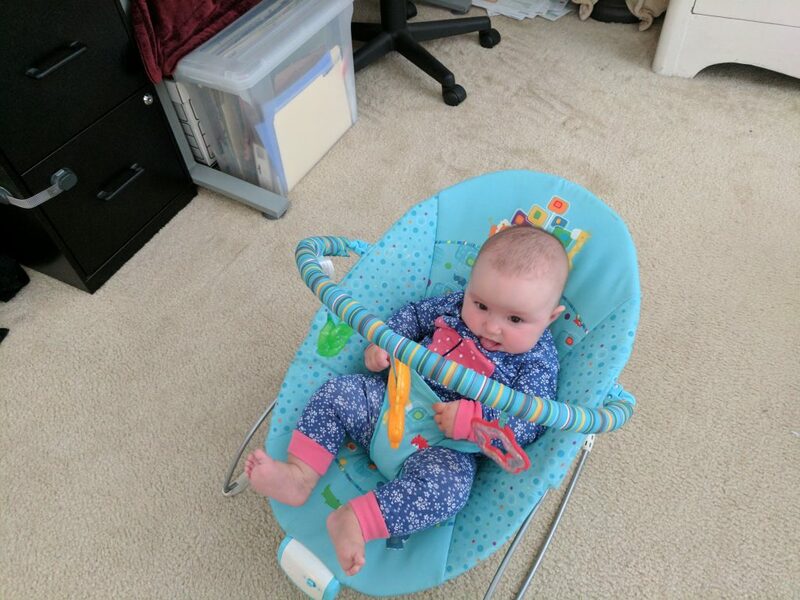 Trying to sit up. She kept simultaneously lifting her legs and head to see if that would make her sit up. 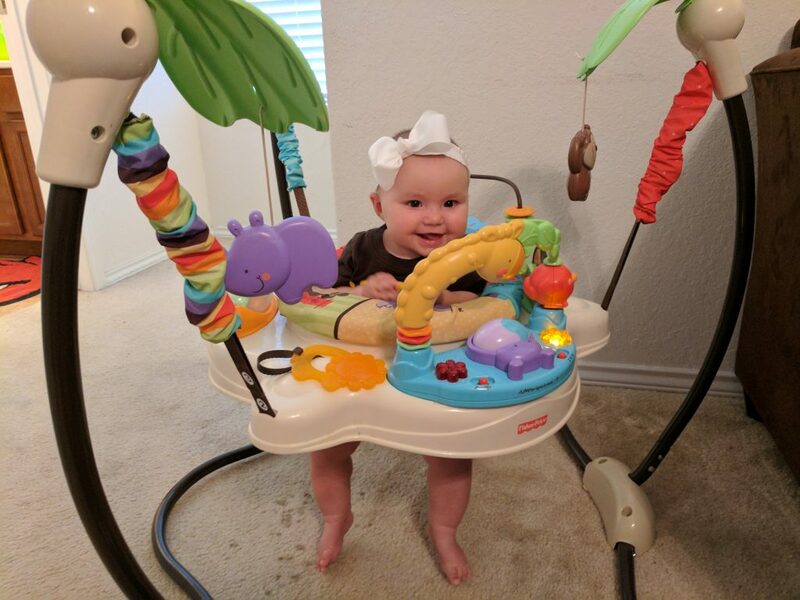 Methinks she won’t be able to be in this thing for much longer…I don’t want her to flip herself over in it. I love how much these two love each other! 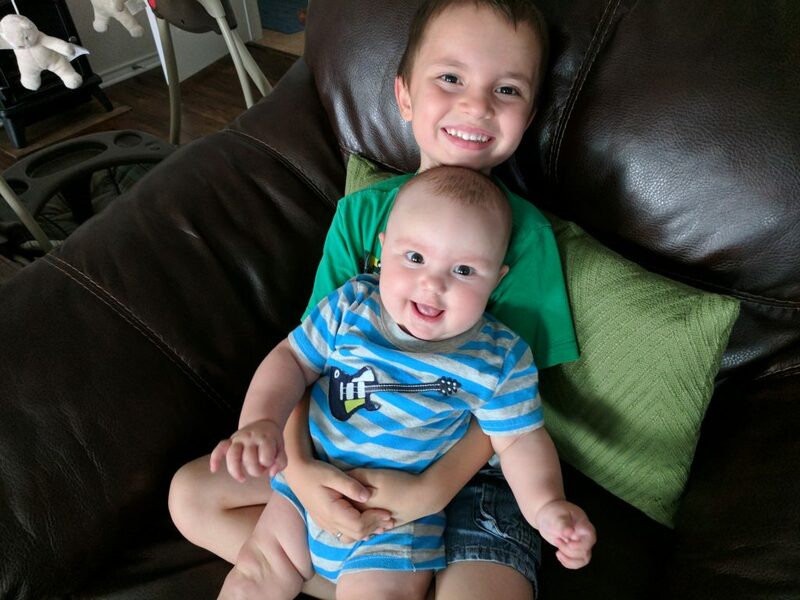 Whenever they see each other, they both get huge grins on their faces. 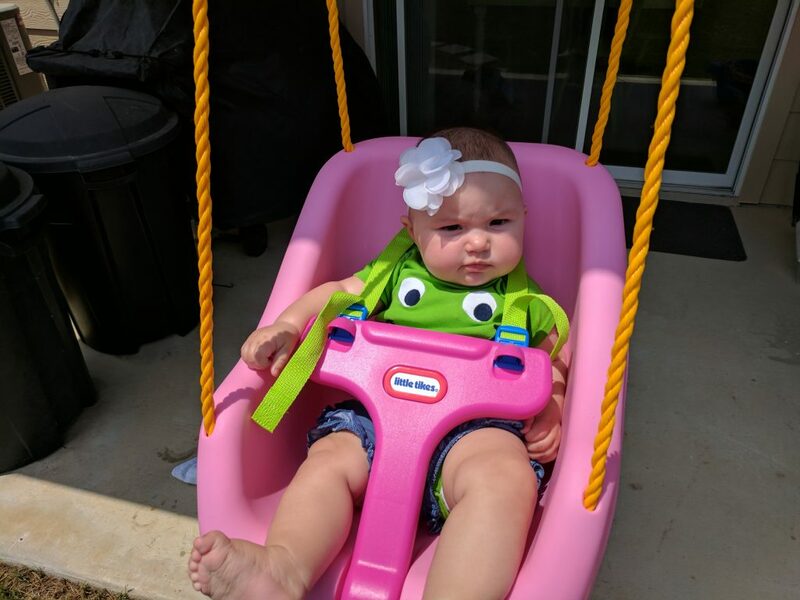 Her first time in the swing. Hanging out in the swing while brother plays in the sprinkler. She’s much happier on her belly if she happens to get her arms positioned right. It makes it so that her face isn’t smooshed into the blanket.